"This simple, healthy, and delicious Mediterranean fish, also known as 'Greek Sea Bass', should be cooked whole. The cavity of the fish can be stuffed with lemon and other ingredients for added flavor. It is a very mild-tasting and versatile fish. The oregano and lemon make it truly Greek cuisine that many will enjoy. Can be found wild-caught in many stores. Enjoy!" Drizzle 1 tablespoon olive oil into a large baking pan; add onion and season with salt and pepper. Place the 2 cleaned fish into the baking pan and stuff each cavity with 1 lemon wedge, 1 rosemary sprig, and some of the red onion. Pour white wine and lemon juice over each fish and sprinkle with oregano. Drizzle the remaining 1 tablespoon olive oil over the 2 fish. Bake in the preheated oven until fish is opaque and flakes easily with a fork, about 25 minutes. Gently slide a spatula between the bones to separate fish; remove all the bones. Serve fish on a platter and garnish with parsley and lemon wedges. Chicken thighs combine with classic flavors of the Mediterranean. If desired, red pepper flakes sprinkled on top of fish impart a little zip to the flavor during the cooking process. Other vegetables such as celery, pepper, or tomatoes can also be added to the pan and/or to the fish cavity. You can also try grilling it and flipping it over once. Delicious! The fish was so moist and delicious! Wonderful recipe! 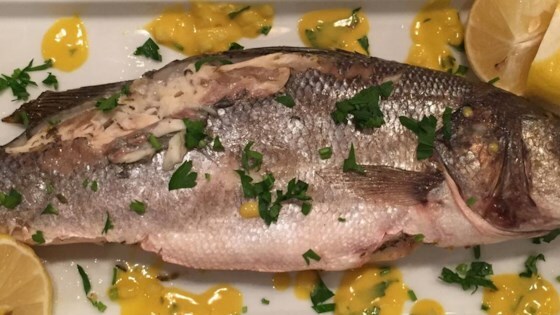 The rosemary and oregano are a nice subtle touch on the delicate lemon juice flavoring with the Bronzino.